I hope you didn't think that I had abandoned Fabric Fridays around here. I was down and out for two weeks during the Christmas/New Year hubbub and well, you know. Stuff. Now, we're returning to some regularly scheduled postings. Fabric Fridays are here to stay! They are fun for me to put together and they remind me that a) I have an overwhelming stash of pretty gorgeous fabric (bad Sunni!) and b) it's nice to pull out this stuff and remind myself what I was going to make and try to start making all the things! Today's fabric: Wool Flannel. In point of fact, this is not a fabric I see very often. Sure, I see my share of cotton flannels, but wool flannel is a different story. You know the fiber type that we're looking at today is wool, but let's take a closer look at what flannel is. Flannel is associated with a cloth that is soft, warm and a bit fuzzy. I've seen flannel in a semi-loose plain weave structure and also a twill weave - I usually see plaids in the twill weave. Flannel is typically brushed on one side or both. If you think of this on a larger scale, it's basically a fine tooth metal brush machine that rubs the fabric to create a fluffiness. The brushing of the cloth makes the staple fibers (the yarns the fabric is woven together with) puffy - the same idea as ratting your hair! The puffy fiber then fills in the loose weave of the cloth and makes it more dense and well, soft. How was that for an explanation? I have to be honest and say that I don't know why we don't see more wool flannel about. Maybe you see more of it where you are in the world. 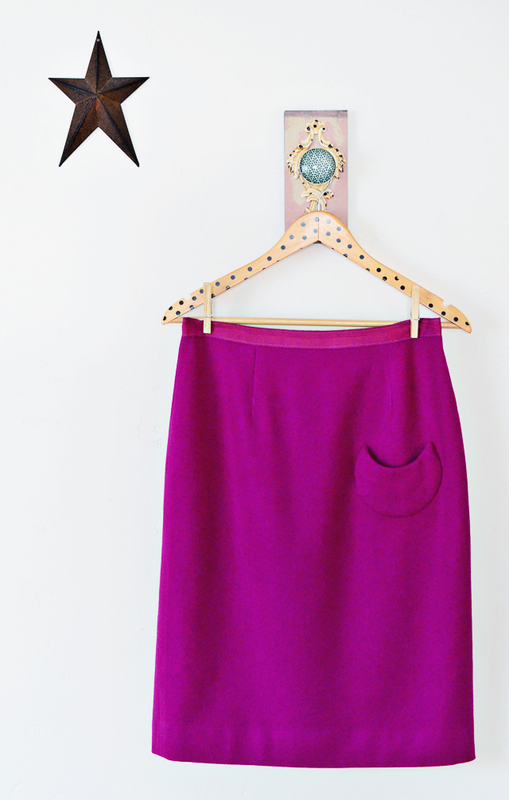 I've made one thing out of a lovely fuchsia color - this pencil skirt. I wear it a good amount and it was a lovely sewing experience. Wool flannel is very easy to work with. Wool flannel has a nice structured hand for the most part, but I've also seen a few that are a bit more drapey and on the finer/thinner side. 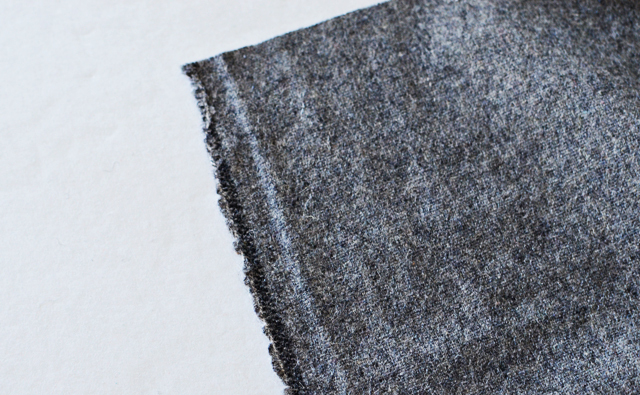 Wool flannel works nicely in lots of different projects - coats, jackets, slacks/trousers, skirts and even shirts. I know one lady in particular who still makes her man those classic Pendleton knock-off wool flannel button-up shirts. What is your take on wool flannel? Have you ever sewn with it? Have some in your stash? I have no wool flannel in my stash, and, come to think of it, have never handled or seen any if it should be a nice "fuzzy" fabric like the very popular buy-everywhere cotton flannel. Does it pill and wear like cotton flannel? I have a lovely pair of grey pinstripe flannel pants, trouser style and cuffed, which never go out of style and seem to be appropriate for such a wide range of situations in that mid space between casual and dressy. hardly ever see wool flannel for sale in regular fabric stores, only those which specialize in woolens, esp. men's suiting. One of my very first sewing projects for a day-to-day wardrobe (i.e., not formal dresses for graduation ceremonies) was a Viyella shirt, which was a washable wool/cotton flannel mix, so soft, warm and comfortable. Oh how I loved that shirt and wore it until it was threadbare. Viyella fabric is no longer made, and I've not seen a wool flannel that I'd be comfortable wearing as a shirt. thank you for fabric Friday so far! Very educational. I haven't seen wool fannel, sounds like something I want to try! Thanks for this series of posts. I definitely want to branch out into using more different fabrics. Can I ask how wool flannel compare to boiled wool? I LOVE wool flannel! It's so nice and warm, and holds up better than cotton flannel, in my opinion. I used it recently to interline a jacket and really liked it for that... it's warm, but also drapey. So, it looks like normal flannel but with more body? I think I have a bunch of it. I just bought a storage unit of fabric and it's high quality stuff. There was a bunch of stuff that sounds like this... It feels like flannel but is way too firm and just better made feeling and looking that flannel... Are there any other ways to tell something is wool flannel? Oh no, it does not! A fine wool flannel is nice and soft, doesn't pill and will last forever! I've worn that fuchsia pencil skirt quite a bit now and no pilling. Viyella sounds intriguing. Such a shame it's not made anymore. Time to break out the flannel pants for your cold snowy day! Wishing you a warm fire! Speaking of LA, I do believe B. Black and Sons is located there. They boast a gorgeous amount of wool, including wool flannel. Bought my fuchsia flannel (the skirt above) from them. Great question Polly! Well, boiled wool is actually boiled and agitated - a process called felting. It's actually wool that has been shrunken. 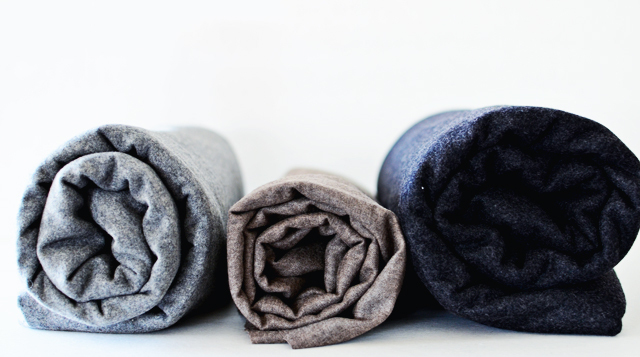 Wool flannel is brushed instead of going through a boiling/agitating/shrinking process. The brushing fluffs up the fibers making the cloth more dense and soft. Hopefully this explanation helps! Oh, never thought of doing this, but this sounds uber warm and lovely! Yum! You could do a burn test. Wool turns to ash, is hard to ignite and when burned it smells like burnt hair. Remember that burning smell from your curling iron days? Yup, that's what you'll smell. I also notice that when you wash wool it has a funny odor, much more noticeable than any other fiber type. So you could take a sample and soak it in some water and see if it has a curious smell. Additionally, there's a bleach test. If you put a sample of wool in a cup of bleach, leave it overnight and check it in the morning, the wool will have dissolved completely. Hopefully this helps you out. I hope you have a bunch of this in your new storage unit. Yum! I've got a small amount of flaming red wool flannel in my stash. I ran out of time last winter, but this coming winter I'm either making it into a mini skirt or a shift dress, whatever I've got enough for. I found it in an op shop (thrift store) and its in a few pieces...... Love your cute skirt pocket! Really like your mustard coloured skirt but I totallllly love the black polka dotted top you are wearing with the skirt. By any chance did you make the top? If so, can you share the details regarding the top - such as the pattern and the fabric, etc.? I recently started to receive your blog and perhaps I missed an earlier post regarding the above mentioned top. I look forward to following your blog in the future. Keep up the great work on the information series on wool etc. I have a degree in Home Economics (the name has been changed) which means I took a lot of sewing and textile classes - your series on wool brought back memories of my university days. Hi Nancy! Thanks so much for your sweet comment. 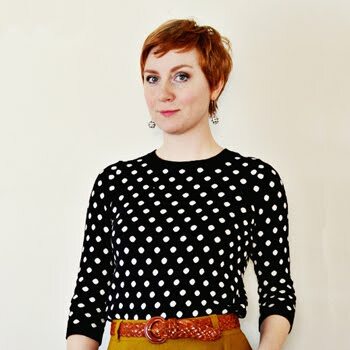 The polka dot top from my last post (Hollyburn Take 5 & 6) is a top from Ann Taylor factory outlet. I am a serious die hard for polka dots - such a happy print! This one seems to go with EVERYTHING! I purchased it pretty recently too, so I would say there is a good chance it might still be available!?! Jealous! I never seem to find good fabric at thrift stores here. So sad. But so happy for you! Your ideas for it sound marvelous! So maybe you have already covered my question in a previous post and if you have, I am sorry. I have been wondering about the itch factor of the wools you are discussing in these great Friday posts. Especially wool flannel and the wool jersey. I love the idea of wool but i cannot imagine investing precious time and money in a wonderful wool if I am just going to be itchy and uncomfortable wearing my garment. That pink skirt is a dream, by the way. i love that little pocket on the front. You are a great inspiration!! You raise a very valid point dani! It's one I think about a lot. As far as with wool knitwear, I've encountered some wool knits that are itchy and some that are surprisingly soft and smooth. If you're purchasing these online, I woud say buy a swatch and see for yourself before purchasing the yardage. The true test is rubbing the wool knit on your arm or neck to see if it itches. I used to think that you could just feel it with your fingers but that's not quite enough. As for wool wovens, I would say that lining the garment is always a good idea. Like for my pink skirt above, it's lined and it has a ribbon waistband so there isn't actually wool touching my skin. These ideas for comfort are a topic I'm going to cover in an upcoming post. So stay tuned! Thanks so much Dani! I was hunting for red wool flannel a few months back on the internet and was unable to find it anywhere; I desperately want it to make a red petticoat for under my 18th century garb as apparently red flannel was warmer than grey. I've had to go without as I couldn't find any wool flannel anywhere at the time. I do have a small piece of what I suspect may be a lightweight wool flannel (twill weave) in my stash, but it's too small for a petticoat, or even a skirt so I'm going to use it for the top layer on some 1810 stays instead. I may not have found wool flannel, but I did find some gorgeous cotton flannel in a twill weave that I totally fell for, it's a quilting cotton so better quality than most and I want more! I love sewing wool flannel. I it is very obedient fabric and the end product always looks great. I made a lovely pencil skirt in light grey that I wore to death last winter. While the garment still looks as new, sadly I've lost weight so will have to remake it if it is to find its way into my winter wardrobe come May. Now that I live in the South, I try not to own or make anything in wool. It takes a lot of care to protect wool clothing from moths and I remember how upset I was when two lovely sweaters got holes. I'll have to give some of these a try! Ah, I would love a piece of Viyella, especially from a Sue in England -- is that really what you are offering? Oh yes, completely serious. Unfortunately, I was thinking optimistically about the cost of postage. The viyella is still wet, so weighing was educated guesswork, but I looked at Royal Mail and the competition - and the cheapest on postage alone was over £40! It's the first time I've tried to send anything to Canada, so you may know of a parcel company which beats everyone. Do let me know, if so. I was going to suggest a reasonable amount for the fabric (£25) but the cost of posting on top may make it prohibitive for you. I did measure up the damp fabric to check dimensions, just in case. There are three separate pieces (each 36"/yard wide, the old-fashioned width) and each piece is a yard and at least 6" long (two of them are slightly longer). Hope we can find a solution. It would be nice to get you kitted-up for that long, hard Ontarian winter.